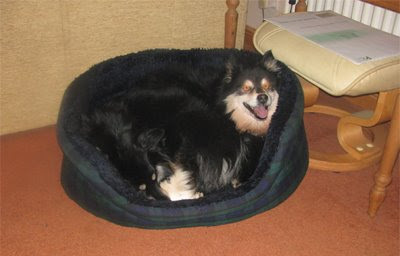 It is now some 20 hours since Smuu and Sisko joined us at Dogs to Stay and other than an initial couple of minutes of angst between Sisko and Kiva all has been quiet. At the time of writing Smuu is lying to my left, her daughter, Sisko is under my chair and Kiva, Smuu's granddaughter is playing in the garden with Mylo. The first night was peaceful - the dogs had a choice of where they could sleep and I am sure that they all slept well, certainly the night was quiet. With access to the outside run (though I am not yet convinced that Sisko and Smuu have fully sussed out the dogflap) there were no accidents though they were all delighted to be allowed into the garden to play on the frost covered lawn. Breakfast was served - 4 dogs eating out of 4 separate bowls - not a sound other then 4 happy lappies enjoying their food. It is a glorious winter's day - cold but with a cloudless sky - perfect weather for a walk across the fields. Lappy days indeed. Now 4 dogs on 2 leads can be a bit of a handful, however our morning walk was wonderful. Mylo and Kiva are well used to the 3 mile round trip, through the village and across the fields before returning back, through the churchyard and past the pub - however for Smuu and Sisko this was unexplored territory so the normal 1 hour walk was close to 2 - oh, so many things to smell and animals to see. I think that they were a little bemused with Mylo as he does have a tendency to want to jump up on every bench we pass - he's no fool; bench = treat - Kiva is quite keen on Mylo's fondness for benches too, and Smuu and Sisko soon cottoned on to the rewards on offer (a small piece of liver cake today). As I write I have 4 sleeping dogs - 3 of them I can see, the fourth (Smuu) I know is asleep - I can hear her snoring. 24 hours have now passed since our 2 guests arrived - life is good, our 2 cats have become used to the 2 additional dogs though Smuu and Sisko have yet to work out that our purkids rule the roost - I am confident that by the time that Smuu and Sisko return home they will have learnt that cats can be fun and quite good company.